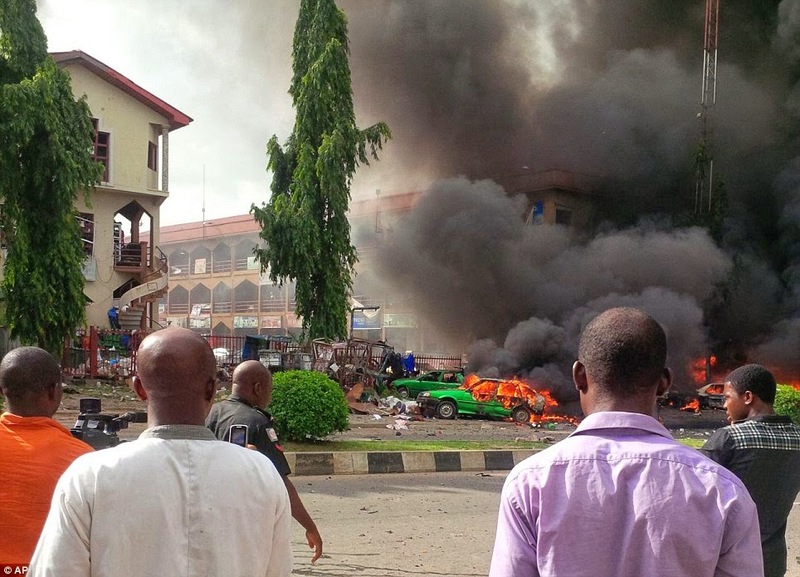 Witnesses said body parts were scattered near Emab Plaza in capital Abuja as black smoke could be seen a mile away. Police said 21 bodies had been recovered and 17 more people were injured as rescue work continued at the site. Mall was reportedly teeming with people just an hour before Nigeria's match against Argentina in Porto Alegre, Brazil. 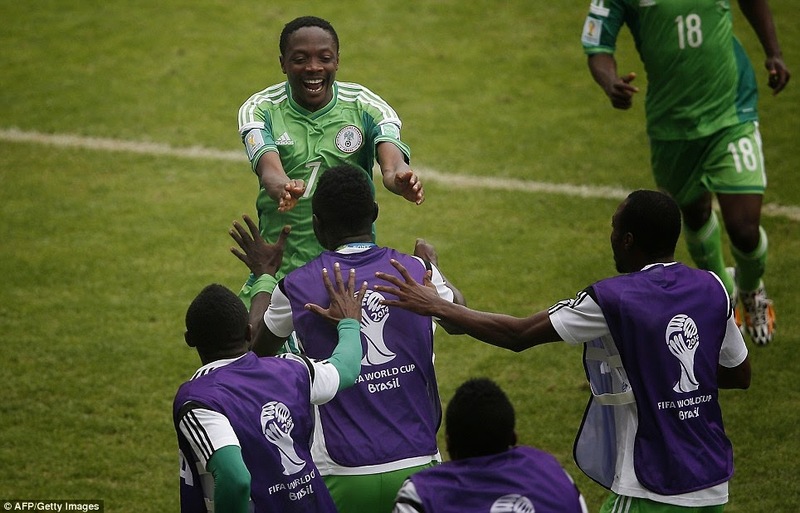 It should have been a national celebration as Nigeria was guaranteed a place in the next round for first time since 1998. 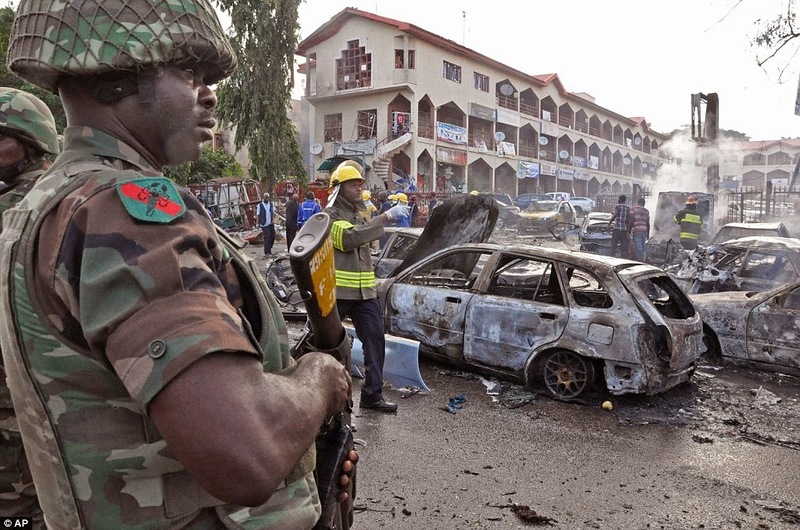 No one has claimed responsibility though attack bore hallmarks of Boko Haram, which has been fighting in northeast. 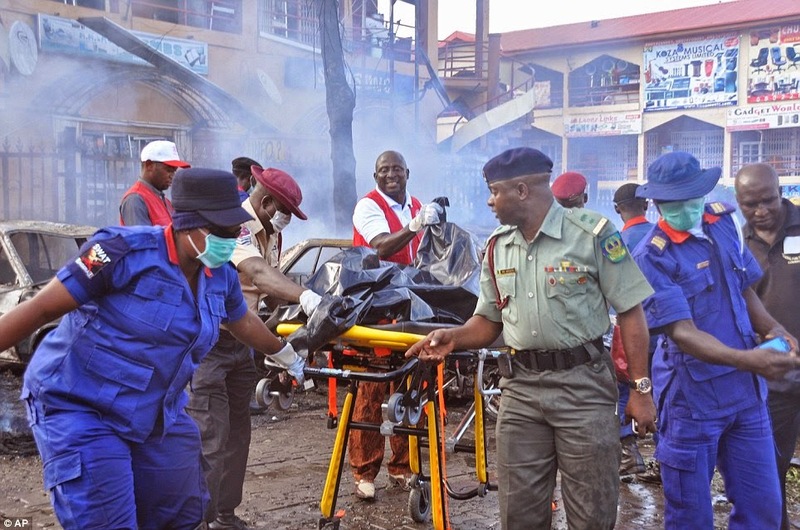 An explosion in a Nigerian shopping mall has killed at least 21 people just an hour before the national football team played Argentina in the World Cup. 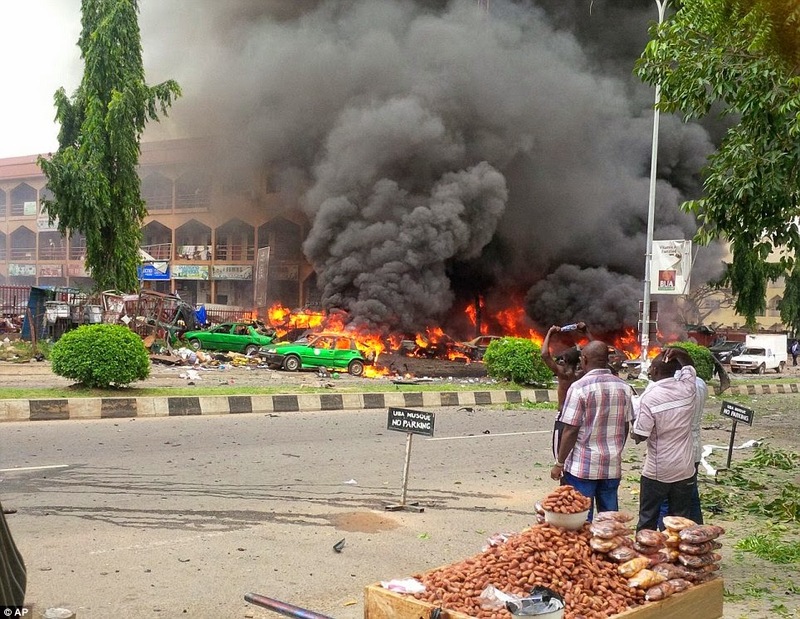 Witnesses said the blast left body parts scattered around the Emab Plaza in an upmarket district of Abuja, as billows of black smoke could be seen from a mile away. It turned what should have been a national celebration into a national tragedy as Nigeria secured its place in the World Cup's knockout stages for the first time since 1998. 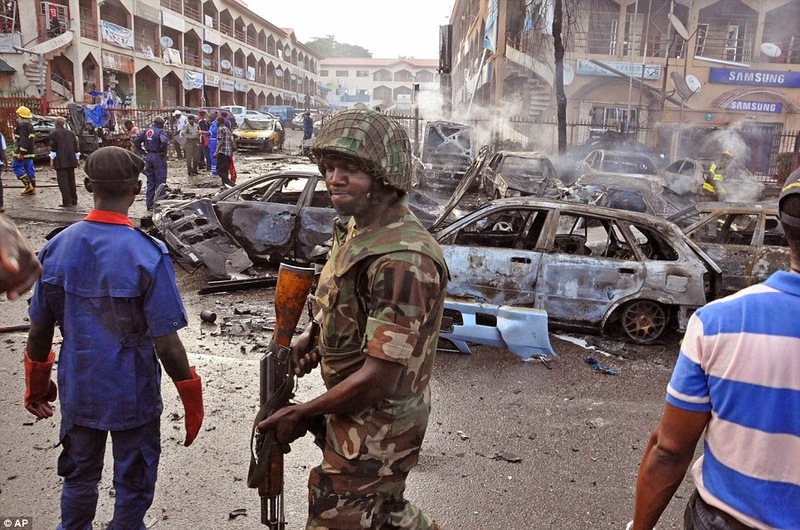 No one has yet claimed responsibility, but the attack bears hallmarks of Boko Haram extremism. 'I heard the explosion and (felt) the building shaking,' said Shuaibu Baba, who had a narrow escape. He said he rushed downstairs to find that the driver who had dropped him a few minutes earlier was dead. 'I asked the driver to come with me, and he said no, he would wait for me in the car,' he added. He also said one suspect has been arrested and investigations have already started. The blast came as Nigerians were preparing to watch their country's Super Eagles come up against Argentina at the World Cup in Brazil. Many shops at the mall have TV screens, but it was unclear if the explosion was timed to coincide with the match. 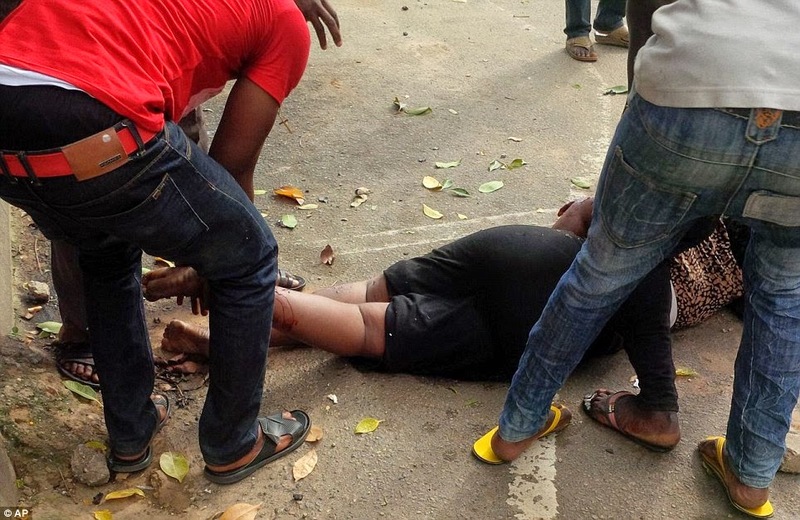 One witness said he thought the bomb was dropped at the entrance to the mall in the Wuse 11 suburb by a motorcyclist, but Mba said it was too early to say. 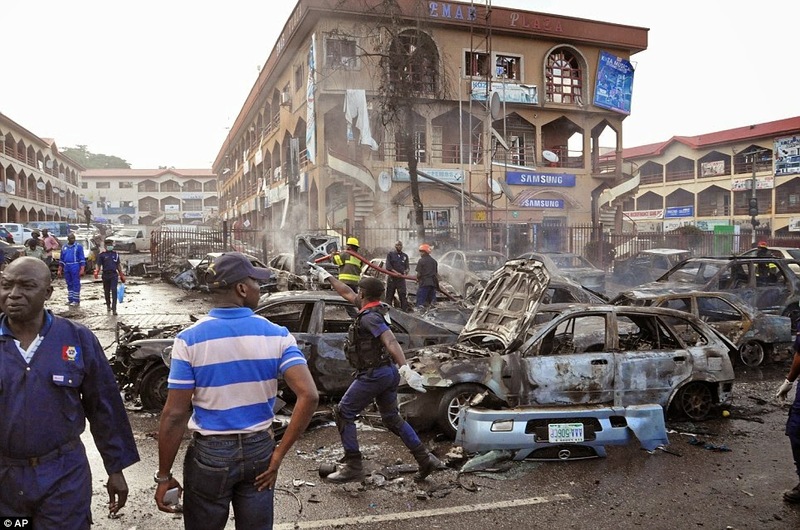 Chiamaka Oham, who was near the site of the blast, told the BBC: 'We heard a really loud noise and the building shook, and people started screaming and running out. The group stage match in Porto Alegre, Brazil, went ahead between Argentina and Nigeria, with Nigeria losing 3-2 but still qualifying for the tournament's knockout stages. Argentine star Lionel Messi scored twice during a tense match which was clinched in the 50th minute. But the game was more of a lap of honour for both Group F teams, as they were already guaranteed a place in the knockout stages after beating Bosnia and Herzegovina and Iran. 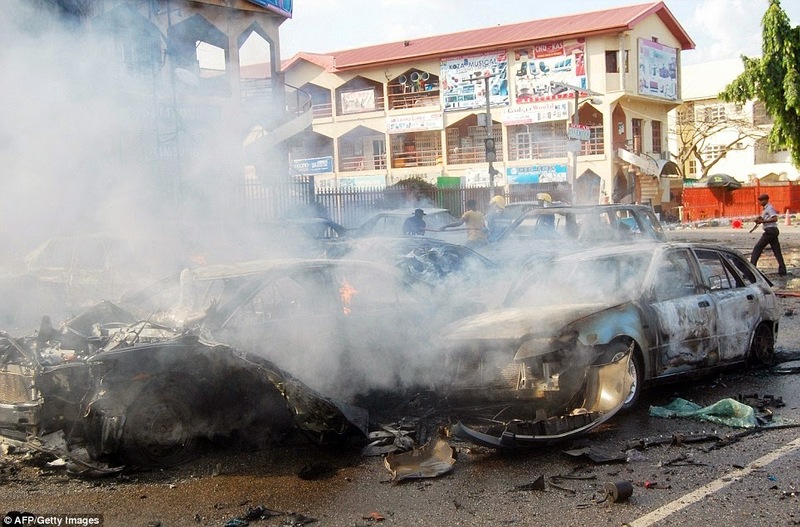 The blast is the latest in a series of violent attacks blamed on the Islamic extremists Boko Haram, who have a stronghold in the northeast of the country. 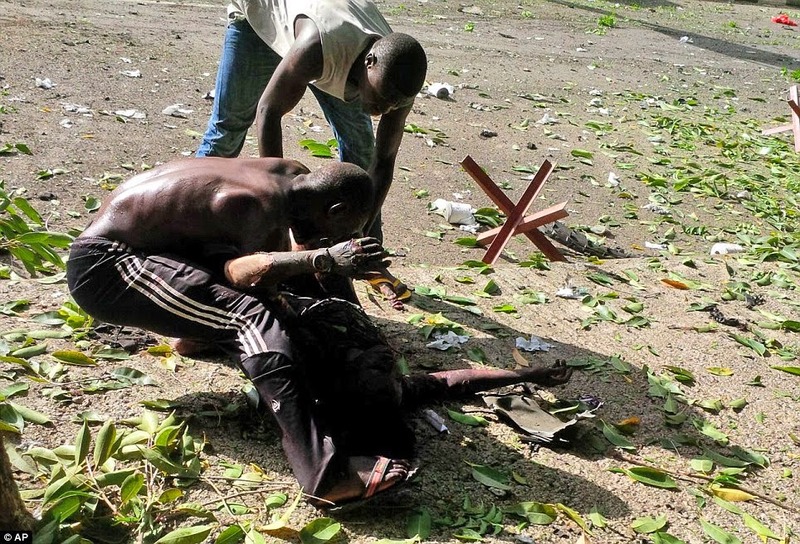 Boko Haram attracted international condemnation for the April mass abductions of more than 200 schoolgirls, and is blamed for this week's abductions of another 91 people — 31 boys and 60 girls and women with toddlers as young as three. 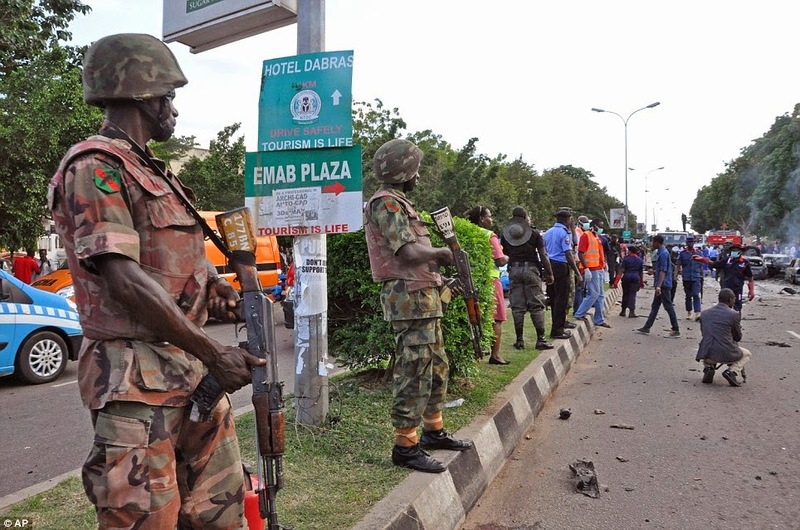 He said that 'every step is being taken by the government to check the activities of insurgents in the country' and advised Nigerians to remain vigilant and conscious of movement of unidentified people. 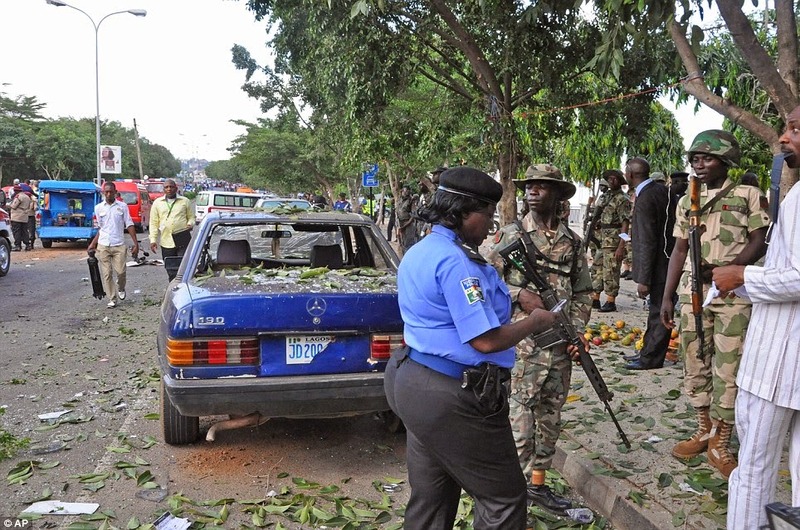 Abuja is in the centre of Nigeria and the militants have spread their attacks to the capital. 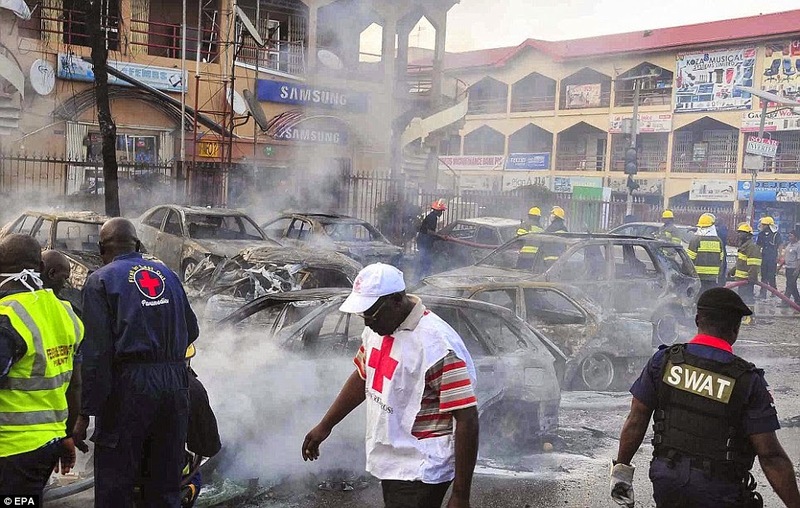 Two separate explosions in Abuja in April killed more than 120 people and wounded about 200 at a busy bus station. Both were claimed by Boko Haram, which threatened further attacks. 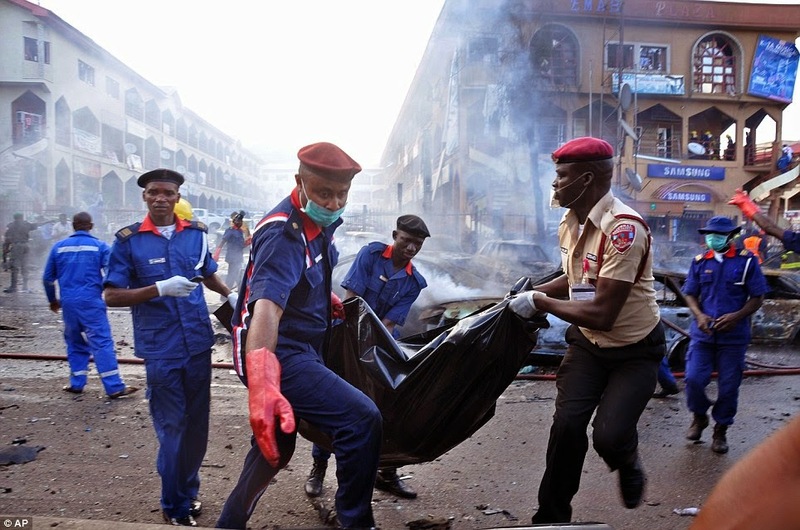 A bomb at a medical college in northern Kano killed at least eight people on Monday, and last week, at least 14 died in a bomb blast at a World Cup viewing site in Damaturu, a state capital in the northeast. 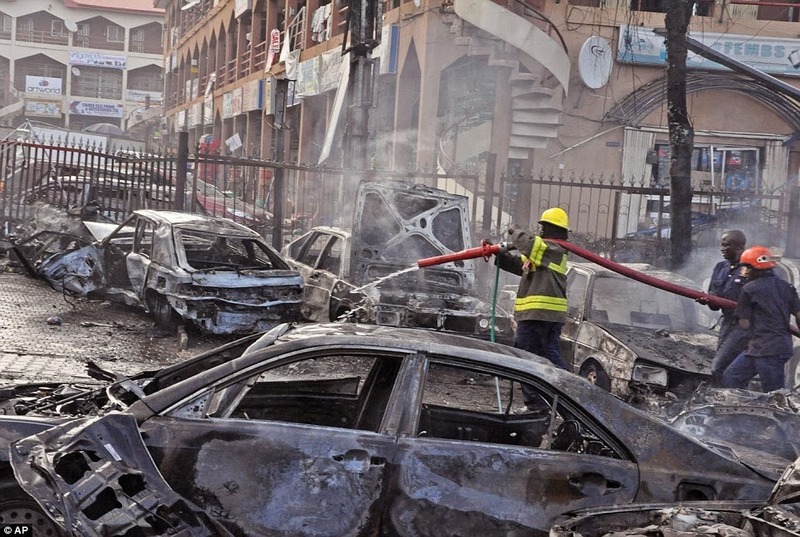 In May, twin car bombs in the central city of Jos left more than 130 people dead; and a car bomb at a bus station killed 24 people in the Christian quarter of Kano, a Muslim city. 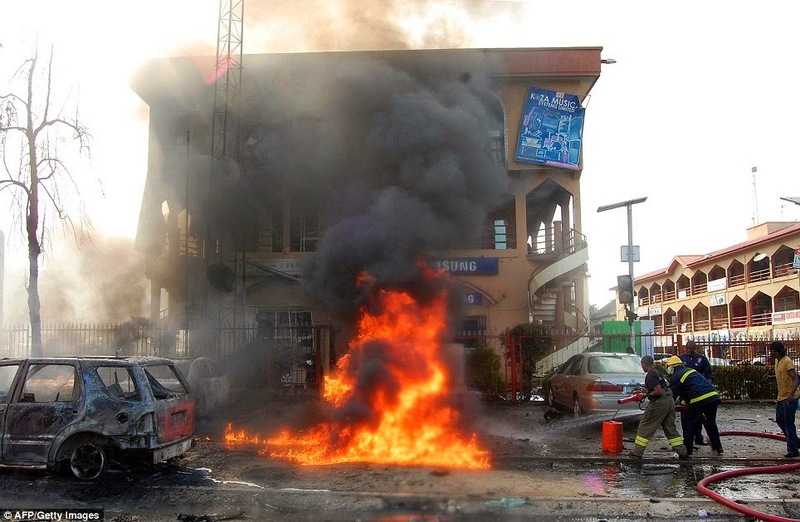 Nigeria's military and government claim to be winning the war in the five-year-old insurgency against the militants. But the tempo and deadliness of attacks has increased this year, killing more than 2,000 people so far compared to an estimated 3,600 killed over the past four years. 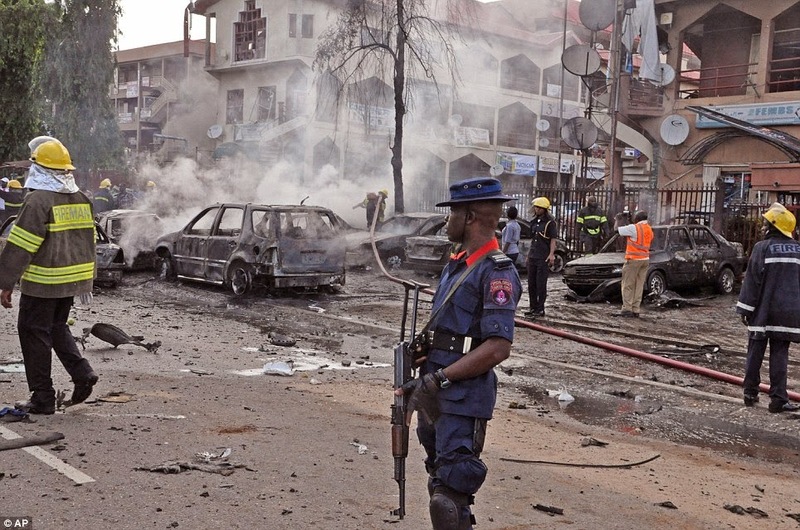 Boko Haram wants to install an Islamic state in Nigeria, a West African nation whose 170million people are almost equally divided between Muslims who are dominant in the north and Christians in the south.